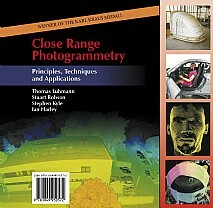 This book provides a thorough presentation of the methods, mathematics, systems and applications which comprise the subject of close range photogrammetry, which uses accurate imaging techniques to analyse the three-dimensional shape of a wide range of manufactured and natural objects. Close range photogrammetry, for the most part entirely digital, has become an accepted, powerful and readily available technique for engineers and scientists who wish to utilise images to make accurate 3-D measurements of complex objects. After an introduction, the book provides fundamental mathematics, including orientation, digital imaging processing and 3-D reconstruction methods, as well as presenting a discussion of imaging technology including targeting and illumination, hardware and software systems. Finally it gives a short overview of photogrammetric solutions for typical applications in engineering, manufacturing, medical science, architecture, archaeology and other fields. This book will be essential reading for advanced undergraduates, postgraduates, academics and practitioners in photogrammetry, metrology, imaging processing and any scientific or engineering discipline where accurate 3-D measurements are used.